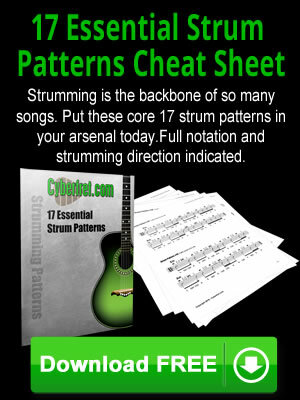 Learning how to play chromatic scales on guitar is important for a few reasons. First, they are just good guitar technique building exercises. But more important than that, guitar chromatic scales help you understand how the fretboard is organized a little better. In this video guitar lesson you will learn 3 different ways to play chromatic scales for guitar. The word chromatic in music means 2 or more consecutive notes that are a half step (1 fret) apart from one another. A guitar chromatic scale contains all 12 possible pitches before arriving back at the starting note name an octave higher. Here are the notes in a C chromatic scale. You will see that there are only 12 different pitches before arriving back at C. There are 12 different pitches, but you also see the 2nd note in the scale is a C# or a Db. That is because C# and Db are just different ways to spell the same pitch. What you will call that pitch really depends on the situation. Often sharps are used when ascending in the chromatic scale, and flats are used when descending. When it comes to playing chromatic scales on the guitar, you are not necessarily starting and stopping on the “root” of the scale. In fact, you should not really think in terms of there being a root for chromatic scales. Any note could be considered the root, and you are not really going to hear all of the notes in relationship to any one note. Playing chromatic scales is really just an exercise in understanding how the notes are arranged on the neck of the guitar. Understanding where the next note higher or lower is, even when switching strings. Like I mentioned they are also excellent guitar technique builders. The first guitar chromatic scale form contains 4 notes on every string. As you move to the next higher string you will shift back one fret, except between the 3rd and 2nd strings which you will stay on the same fret. This is because of the way the guitar is tuned. The next 2 guitar chromatic scale forms stay in one position on the neck. This video guitar lesson will show you how to play these chromatic scales for guitar without shifting position like you did for the first form. If you want to stay in one position when playing a chromatic scale you will use the following forms. Use form #2 when ascending, and form #3 when descending. Here is a graphic that shows how the notes in form #2 and form #3 compare to each other. The red line is drawn between the notes that are the same. You certainly could play form #3 when ascending, and form #2 descending. But it’s easier to have your first finger start on a lower fret and move up than it is to do the opposite. You are starting out of position, and moving back into position. A position is a 4 fret area where a finger is assigned to each fret. Notes that are one fret lower than the position are played with your first finger. Notes that fall one fret higher than the position are played with your fourth finger. When playing chromatically it’s always easier to play a note that’s out of position and move into position than it is to start in position and move out of position. That’s why it makes the most amount of sense to use form #2 while ascending, and form #3 when descending.